Leptochloa fusca ssp. fascicularis. Dave Gealy and Howard Black, USDA, Agricultural Research Service (Accessed 5/2014). Leptochloa fascicularis var. 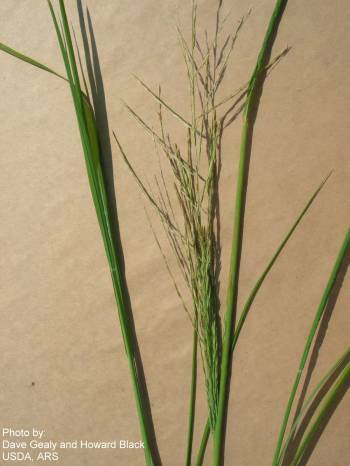 maritima is a perennial C3 grass (Waller and Lewis 1979) to 50 cm, erect to prostrate, tufted, densely branched from base. Leaves alternate, 0.1-0.3 cm wide, rough above, ligule to 0.6 cm, membranous. Flower spikelets 6-12, to 1 cm long, glumes narrow, the 1st about 0.3 cm, the second 0.4-0.7 cm long, lemmas 0.4-0.5 cm, finely hairy at base, and lower veins, apex with a short awn to 0.5 cm, between 2 teeth; inflorescence branched, narrow, to 30 cm long, 5 cm wide; blooming and fruiting July-Oct.
Habitat: Open, wet areas, ditches. Tolerant of saline or alkaline soils pH 4-7.5, intolerant of shade, fire (USDA, NRCS 2010).